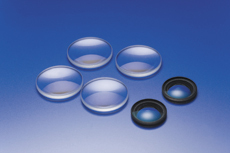 HOYA has vast polishing capacity for the spherical glass lens refer to digital camera, video camera and interchangeable lens. HOYA has established one stop lens fabrication facility(from the pressed lens blanks fabrication to the finished spherical lens) in the Kingdom of Thailand with attractive lead-time, mass production capacity and cost effective pricing.Prototype production request and quick delivery to the mass production starting stage are also available. Pressed lens blanks are supplied from reheat-press factory next to the lens polishing factory. In-house centering process are ready. We can apply to the specific multi coating request up to the customer request, please feel free contact us. Also we have in-house production capacity for the special lens cutting such as D-cut or I-cut. Lens painting or cementing(aspherical/spherical) request are also acceceptable. Please consult us about the concrete tolerance of each lens drawing, if any.